GRAVITY | You gotta get a critic. 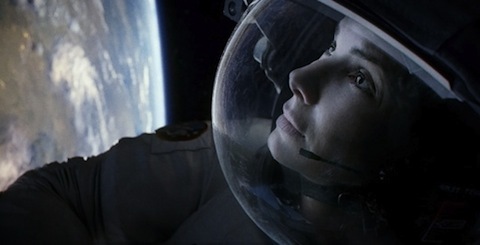 Watch the beautiful shot of Sandra Bullock looking to Earth like the Starchild in 2001: A Space Odyssey (see below). Gravity let me wonder if this is how first-time audiences saw 2001 or Star Wars. The technology really is something in 3D. It’s the second time I felt the $3 surcharge was absolutely justified (the first was Life of Pi). Alfonso Cuarón’s view of space is immediately magnificent and dangerous. In the past, the director proved his understanding of youthful emotions (Y Tu Mamá También to Harry Potter and the Prisoner of Azkaban), characters on the cusp of development. Sandra Bullock’s solitary astronaut Dr. Ryan Stone is also on the cusp of change, forced to pull together and survive through sheer force of will. Gravity feels like a religious experience, watching Ryan grapple with her faith in herself. Underneath the suspense, there’s the expected backstory and some third-act Life Lessons. Bullock isn’t showy, letting the situations around her do their work; smart of her. Beyond the suspense, there’s a character’s troubled past, and some third-act Life Lessons to follow. But Cuarón takes these ordinary trappings, and makes us feel for ninety minutes like we’ve never seen a movie like this. For Your Consideration: Best Picture; Director (Alfonso Cuarón); Sandra Bullock; all technical categories. Hi! Have no other contact info for you. Can u give me your email address so I can copy u on the What a Character! blogathon schedule msg? Thanks! In case you didn’t get my e-mail, mine is joshua.garstka@gmail.com. Thanks!